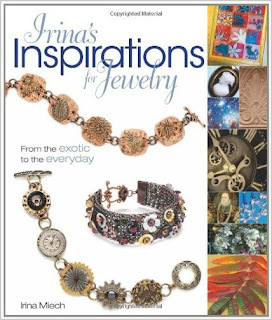 I have long been an admirer of Irina Miech's designs, which you will often find gracing the pages of Bead&Button, BeadStyle, and Art Jewelry magazines. Now you have the opportunity to slip into Irina's mind and see just how she comes up with her amazingly versatile ideas! I like the organization of Irina's Inspirations for Jewelry. Irina starts with easier projects and moves into more challenging ones as you go. The first project to use a basic technique, such as crimping, has detailed instructions. Thereafter it is assumed that you know how to do it, but there is also a technique summary section for easy reference. From a simple but beautiful necklace inspired by autumn leaves that uses preformed components, all the way to a metal pendant that you will cut out and stamp with your own design, Irina's 24 projects are beautifully thoughtful. I love how she shows you the object or photo that inspired her design and explains how she translated that inspiration into the finished piece of jewelry. It reminds me a lot of what we did here on Beading Arts during the month of April, our Spring Fever Month. My favorite piece in this book is Shades of the Ocean, found on page 46. Irina uses subtle color shifts in Swarovski crystals to create a necklace that is truly reminiscent of the ocean's many moods. I wish I could have found a picture of it online to share with you!